Is a highly effective treatment for pain and chronic ailments. In practice, it is actually very similar to traditional acupuncture. 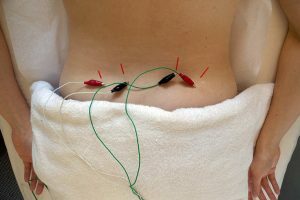 Using the exact same system of acupuncture, the practitioner inserts very thin and sterile needles into specific points along the meridians of your body. She then attaches the needles to a device that delivers gentle electrical pulses between two points. This helps restore the healthy flow of Qi (life energy) through your body, removing any blockages and clearing out stagnant areas, thus creating a stronger experience of health and well-being by restoring the flow of Qi.